Keep your computer cleaner, and out of the way. Move your computer to a more convenient location with our under-desk mounting kits. Save floor space or desktop space, help keep dust and dirt out of your computer case, and keep your media drives within easy reach. Constructed of rust-proof powder-coated steel, these stylish brackets brackets adjust to fit virtually any size tower case or can be used to conveniently mount a desktop case on its side. Fully padded with anti-scuff, anti-skid foam to eliminate case damage and prevent the computer from sliding out of the bracket. 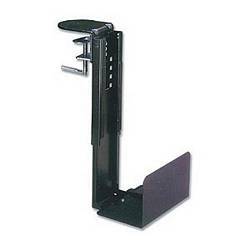 Pros: This holder is surprisingly solid in construction (steel throughout) and offers a good range of adjustment for cases of varying sizes. Once assembled and clamped onto a sturdy desk, there is no movement of the holder or the computer. Cons: Not really a con, but initial assembly can be a bit fiddly, since three separate pieces need to be held in alignment to thread a bolt. Nothing that can't be handled with a bit of patience, though. Other Thoughts: A great product that does its job. 1279 out of 2557 find this review helpful.